1. Put the flour and xanthan gum in a large bowl. Add a third of the butter and rub it into the flour with your fingertips to create a rough breadcrumb texture. Add enough water to form a soft dough, then turn out onto a floured sheet of cling film and roll into an oblong about 30cm x 20cm in size. 2. Dot the remaining butter over the bottom two-thirds of the pastry sheet. Fold the top third down over the butter, then fold the bottom of the pastry up to completely enclose the butter in an envelope of pastry. Press down the edges to seal. 3. Turn the dough 90 degrees then roll out into a 10 x 30cm rectangle. Again, fold the top third down and the bottom third up once more, as if creating an envelope, then press down the edges. Chill for about 20 minutes then repeat this process twice more. Chill for 30 minutes or more before using. 4. Preheat the oven to 200C, gas mark 6, and line 2 baking trays with baking parchment. On a floured surface, roll the pastry out into a large rectangle about 30cm x 40cm, trim off any ragged edges, then cut down the middle horizontally into two long rectangles. 5. 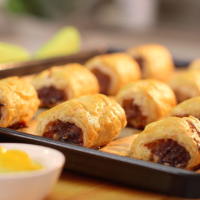 Roll the sausages in your hands to elongate a little, then place down the middle of each pastry rectangle. Brush a line of beaten egg along one edge of the pastry, then roll the pastry over the sausagemeat onto the egg-washed edge, tucking it under to seal. Press down and trim off any ragged ends. This recipe was first published in Tue Nov 08 10:02:18 GMT 2016.